Life in Brisbane is a rolling celebration. I'm here to invite you to the party. I'm new to the game of free-lance and excited to throw my passion into something. Just when you think everything has been done before, you stumble across a surprising innovation, or product, or story. Sometimes, when you're really lucky, (and seemingly least expecting it); you discover something that's all three. Sometimes the story is a bit cheesy – and this one certainly is, in all the right places. Andrew Williams, a Brisbane local, never expected his thirty years in the construction industry to end abruptly in redundancy. What came next; he had never even dreamt about. Music Box Cheesecake started on a simple premise. Andrew and his wife Jacqui love cheesecake. I mean, they love cheesecake. So much so that what started as playing around with a few flavours and having friends try them has turned into a business that takes up more than half of Andrew's week between orders, making all of the ingredients from scratch, (including the decadent caramel) and catering for big functions. Who doesn't love a modern twist on a classic? Andrew and Jacqui didn't want to just stop at making cheesecakes, however. They wanted their customers to have an experience. Heard of wine matching? Sure. Culinary connoisseurs have taken it as far as beer matching with your favourite foods. The next hottest thing? Cheesecake matching. Having a tomato based curry for dinner? Andrew's got a cheesecake for that. Feeling like a nice piece of fish? He's got you covered. In fact, just in case Andrew hasn't got that exact taste sensation you're craving – he'll help you make your own. And the best part? You then own that flavour – for keeps! If you aren't feeling particularly inspired when it comes to flavours, luckily these guys were. From Pear and Blue Cheese to Port Spiced to a Nutella Cheesecake Sunday, Music Box offer a "Symphony of Flavours". Starting to see a theme here? That would be the inspiration of the couple's daughter, who is a working musician. And just in case they didn't have enough to keep them going in the "foodie" direction; their son, who is a chef by trade might have helped a little with the technical stuff. Talk about keeping it in the family. This reviewer loves a good pun, and was thrilled to hear a few inspired names such as the Drunken Sailor, (yep, there's real rum in it) and the Power of the Passion. 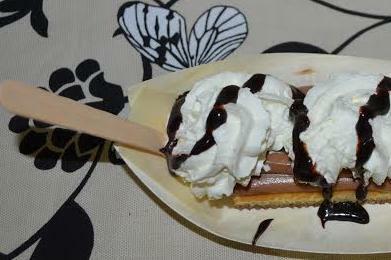 So get down to the Eat Street Markets and pun-ish yourself this weekend by indulging in one of the decadent flavours. In a hurry? Not a problem – they also come in waffle cones so you can walk off that bliss as you experience it. Andrew and his wife a Brissie born and raised, and love the laid back lifestyle and the great outdoors. This has inspired the "food van" style catering and creating a portable dessert that won't melt between your fingers. 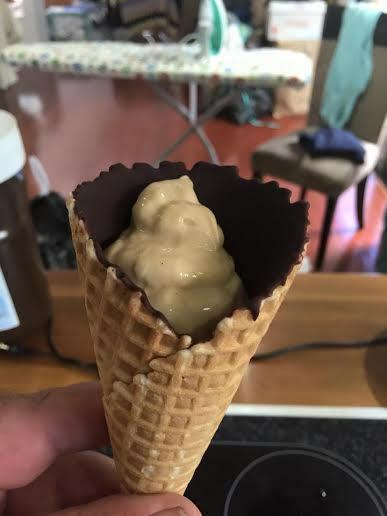 And before you ask; yes it's a waffle cone – and a chocolate coated one at that. "You come to a point in your life when you have to work out what's valuable to you. Making a million bucks – or enjoying life. Really, it's a no-brainer." Amen Andrew – I think I'll have another slice. Musicbox Cheesecake has a website that's currently being perfected – but don't fret. You can find them on Facebook using the link below. And if you order 12 mini cheesecakes or more, (office morning tea, anyone? ), Andrew will deliver them straight to your door at no extra cost.